As some West Virginia residents continue to await confirmation about whether their tapwater is safe to drink, new technology is being developed that might one day dramatically cut down the time it takes to bring water supplies back online during such disasters. "In this day and age when you can send a tweet from a shower, the ability to get immediate information is just essential," said Mark Peterman, the president and co-founder of rapid water testing startup Ondavia, one of 12 companies named a finalist in Imagine H2O's annual global competition for water startups two days before the massive chemical spill affecting West Virginia. "These are issues that affect human health." Water is also an increasingly prevalent business concern. In its 2013 US Water Report, the Carbon Disclosure Project found that nearly half of the S&P 500 companies who responded said they have experienced water-related costs. Some reported costs of up to $400m, and projected those costs could one day reach as much as $1bn, according to the study. Although many companies listed "water scarcity" as their biggest concern, the number of businesses who said water quality was a "substantive business risk" grew considerably over 2012, with 31% more respondents listing it as a risk for their direct operations and 69% more naming it a risk for their supply chain. Stable water quality is crucial especially to the US's booming natural gas industry, the CDP report said. OndaVia, which already counts oil and gas companies as well as environmental remediation firms among its customers, entered the competition to reach potential clients in agriculture and food and beverage processing. OndaVia wants to expand the range of customers who might benefit from its portable detection equipment, which allows users to deploy interchangeable cartridges to test for a variety of contaminants in the field, instead of lengthy lab tests that can delay solutions. Winners will be announced in mid-March. "Unless you're willing to pay a very large amount of money to accelerate the testing, it's going to take a fair amount of time to get results back," Peterman said. Here's how it works: if a farmer wants to test for a particular contaminant, say, perchlorate – a chemical that occurs naturally but is also found in bleach, fertilizers and other products, and may cause thyroid problems – he or she would connect OndaVia's shoebox-sized reader to a laptop computer, place a drop of water on a cartridge calibrated to test specifically for perchlorate, and plug it into the reader. (Peterman says he hopes the system can be scaled down in the future.) Two to five minutes later, the system generates detailed data about the concentration of perchlorate in the sample. "It's that speed of being able to do the testing and get immediate results, and we are also making a system as easy to use as possible so it doesn't require PhD chemists in the lab doing the analysis and interpreting the results," Peterman said. "The guy that's normally out in the field collecting the samples, could be going and getting the results, logging them right there and going on to the next well." OndaVia's testing equipment uses a process known as Raman spectroscopy. The technique illuminates samples with lasers and identifies molecular "fingerprints" based on the spectrum that's returned. Other enterprises also use Raman spectroscopy to analyze water quality. A team of Dutch researchers, for example, have used it to test for bacteria such as E coli and Legionella. Peterman wouldn't discuss details about specific customers, though he said Ondavia works with companies like Nalco, a water treatment services firm (and a division of Ecolab), an oilfield services provider called Schlumberger, and General Electric on a variety of applications. "I expect the outcome to be some kind of acquisition, just because the capital needed to build up the sales and marketing for something that does dozens or hundreds of different cartridges is rather large," Peterman said. "There are a lot of different directions it could go." Will Sarni, an enterprise water analyst with Deloitte, wrote the executive summary of the CDP report, in which he noted that investors are beginning to identify opportunities among the many risks in the water sector. "Where there are quantifiable risks, there are business opportunities in new products and services," Sarni wrote. "These opportunities include investments in new technologies and companies and the development of new business strategies." Sarni isn't familiar with Ondavia specifically, but said real-time information about water could matter to a variety of businesses, such as the mining industry. "The mining sector can't select where they mine, so if they're looking to extract ore in a water-scarce or stressed region, they have to think about being very efficient with respect to water or ensure that they have desalination equipment." Ondavia's selection as a finalist follows a two-year, $450,000 award from the US Agriculture Department last fall that will fund the company's development of cartridges to test for boron, a mineral that can be toxic to crops. Whether or not OndaVia wins the Imagine H2O competition, the company will evaluate its business strategy. Peterman says the contest is providing key feedback about which key contaminants farmers and food processors want identified most. "We can only swing the bat so many times as a startup, so let's hit a good pitch and pick the right contaminant," Peterman said. So far, though, the product isn't approved by regulators to use for official compliance, so the company is doubling down on its process controls. Peterman believes OndaVia can help prevent refineries from expensive shutdowns before a corrosive chemical reaches crisis limits, or provide information about pesticides and herbicides being washed off crops so farmers can make adjustments in real time. For now, however, official, slow lab analysis will still be the norm. The science is evolving so fast, Peterman said, that he thinks the future of water testing will look like something out of science fiction. "[Water testing] is going to reach a point where we're going to end up with a tricorder and Spock's going to be able to go out and wave it over the water and get a list of everything that's present," Peterman said. "We'll get there. We'll get there with one technology or another, but we're headed that direction and we're headed there fast." Menon Biosensors, Inc. a molecular biochemistry company providing DNA analysis for the diagnosis and treatment of biological pathogens, announced today that its M2 (Molecular Mirroring) NMR (nuclear magnetic resonance) technology successfully demonstrated quantification of pathogens having concentrations ranging from 1 CFU to 100 million CFU per sample. The study results represent eight orders of magnitude in dynamic range. Sample to answer continues to take less than one hour, as with the company's other reported study results for detection of Clostridium difficile (C. difficile), Mycobacterium tuberculosis complex (TB), Anthrax (Bacillus anthracis) and Plague (Yersinia pestis) in concentrations as low as 1 CFU per sample in several specimen types. "Using the unique platform detection technology of M2, our scientists were able to develop a novel amplification approach, combined with random sample access to achieve quantification of eight orders of magnitude in dynamic range. This method is applicable to quantify both bacteria and viruses while delivering unmatched sensitivity," stated Suresh Menon, Ph.D., President of Menon Biosensors. "Sample to result remains less than one hour. We will continue to demonstrate the wide dynamic range particularly for HIV and Hepatitis C, in addition to pathogens infecting immunocompromised hosts. This dynamic range and sensitivity has applications in food safety, biodefense and livestock screening, where timely detection and quantification are often very useful." Continued Dr. Menon, "Menon began developing and testing assays for the healthcare industry in mid-2013, and we have since achieved a multiple level of improvement over current industry standards. Detection and quantification of pathogens across a wide dynamic range in under one hour provides healthcare providers with critical information currently lacking in delivering quality, effective care. Rapid determination of the "pathogen load", particularly for viruses, gives physicians the ability to accurately and timely diagnose infections, select the most effective treatment, assess disease progression, and monitor response to therapy. Since 2005, Menon has developed and tested 35 bacterial and virus assays. We intend to expand our portfolio of assays and the dynamic range of M2 technology in the coming months." Menon Biosensors will release the quantitative data to the largest prospective diagnostics company partners in the coming weeks, showing detection of Yersinia pestis from 1 CFU to 100 million CFU per sample. The data represent a monotonically increasing sequence as a function of various parameters used in M2 technology to detect and quantify the pathogen. M2 technology was developed initially to establish rapid countermeasures against bioterrorism. Menon's technology provides superior results that enable officials to make intelligent, quick decisions following detection and exposure to lethal bacterial agents such as Anthrax (Bacillus anthracis) and Plague (Yersinia pestis). Testing of Menon's biosensor technology to detect against bioterrorist attack became public information in a press release by the Department of Homeland Security in August 2012. Menon Biosensors' M2 technology has been validated through multiple studies with the U.S. government's Biodefense Programs. In these studies, conducted with more than 3,000 samples over a six-year period, the technology demonstrated greater than 99 percent accuracy in the presence of interferants and near neighbors of the pathogens to be detected. Providing accurate results in less than one hour from the time a sample is collected, Menon Biosensors' M2 technology will allow medical professionals to quickly treat a pathogen with the appropriate therapeutic. Current diagnostic techniques for many pathogens can require several hours to multiple days for accurate detection, which limits treatment options early in the patient's care. The M2 technology also serves the need for diagnosis in food safety/livestock applications. Menon Biosensor' platform technology is portable and offers random access testing with no cold chain requirements for the assays. A good deal of diagnostic tests are easy to perform but require a trained eye to interpret the results. Particularly with lateral flow assays, most famously used in at-home pregnancy test strips, simply knowing which lines mean what for different tests can require significant training and memorization. But cameras and computers can help automate that process and Google Glass has both, and in a convenient form. A study just published in ACS Nano discusses the development of a Google Glass app that lets a clinician simply look at the lines on a test strip and receive back the correct interpretation within seconds. The app is voice controlled and provides both yes/no, as well as quantitative results depending on the test. The strips are marked with individual QR codes to identify which test is being performed and the app is supported by a server that actually analyzes the images and sends results back to Google Glass. A follow up to the ACS Nano paper is an announcement that Holomic is launching a Google Glass Platform for the measurement of rapid diagnostic tests (RDTs) and lateral flow immunoassays. Developed at the research lab of Professor Aydogan Ozcan at UCLA and licensed by Holomic, the Glass Platform is the first Glass diagnostic application to read RDTs for the real-time diagnosis and tracking of various diseases and health conditions. Rapid diagnostic tests are widely used globally as a cost effective and quick method of diagnosing health conditions. They test for a variety of conditions including HIV, malaria, diabetes, thyroid, cardiac and other chronic and acute indications. Their accuracy and reliability can be significantly improved with digital readers, however, these tend to be expensive and bulky. Holomic introduced a cost-effective smartphone-based reader (HRDR-200) in 2013, and is currently delivering this quantitative reader for the accurate reading of rapid tests and connectivity with Electronic Health Records. With the Google Glass Platform, Holomic continues to lead in innovating technologies for point-of-care diagnostics. The Google Glass Platform includes a custom-developed Glass Application software downloadable from the Google Glass server to your Glass. It is intended for use with RDT cassettes marked with QR code identifiers in well lit ambiances and no other hardware is required. It works like this: the Glass user looks at the RDT and with a voice command leads the Glass to acquire the RDT image with its camera and to transmit it to the Holomic Cloud-Server for rapid post-image processing. The server can be accessed from anywhere using a web browser to see a dynamic spatio-temporal map and real-time statistics of uploaded test results. Professor Ozcan and his team have tested the system with RDTs for HIV and PSA and have obtained outstanding results. Google's Glass is still in beta and available only to a limited number of users. Likewise, Holomic’s Glass Platform (Glass Application and Holomic Cloud-Server) will initially be available only to a limited number of researchers at universities and rapid test development organizations. Holomic's objective is to collaborate with Google, the Ozcan Research Lab at UCLA (see below), and the user community to further advance this promising platform for improved healthcare. Researchers from UCLA’s Henry Samueli School of Engineering and Applied Science have created a Google Glass application and server platform that lets Glass users analyze point-of-care diagnostic tests targeted at a wide range of diseases and health conditions. The researchers say the technology has the potential to enhance the tracking of dangerous diseases and improve public health monitoring and rapid responses in disaster-relief areas or quarantine zones. The system relies on the use of rapid diagnostic tests (RDT) in which blood or fluid samples are placed on small strips that change color to indicate the presence of a range of diseases and conditions. Tests that can utilize this type of technology include HIV, malaria, and prostate cancer. Using Glass, the user captures an image of the test result. Once the image is caught by Glass, it is uploaded to a UCLA-designed server platform which relays accurate analysis of the RDT in less than eight seconds. The technology also works with commonly available in-home tests. The technology allows for quantified reading of results to a few parts-per-billion of sensitivity. This is much greater than the human eye can see, therefore eliminating the potential of human error in results. This breakthrough technology takes advantage of gains in both immunochromatographic rapid diagnostic tests and wearable computers. This smart app allows for real-time tracking of health conditions and could be quite valuable in epidemiology, mobile health, and telemedicine. The server is capable of processing fast and high throughput evaluations of incoming RDT images coming from multiple devices simultaneously. A web portal where results can be viewed was also created. Maps charting the geographical spread of diseases and conditions and the cumulative data of all tests submitted over a period of time can be viewed through the web portal as well. The researchers tested the technology on in-home HIV tests designed by OraSure Technologies and a prostate-specific antigen test from JAJ International. Images were taken under different conditions of light. Out of 400 tests submitted, the RDT reader was able to read 99.6%. Every test result read was accurate and quantified according to the researchers. Additionally, over 300 blurry images or images of the testing device taken under various natural-usage scenarios were successfully read 96.6% of the time. bioMérieux, a world leader in the field of in vitro diagnostics, is pleased to announce that the launch of VIDAS® C. difficile GDH makes it the only company with the width to provide solutions for C. difficile according to different laboratory settings, patient conditions and medical needs. Clostridium difficile is a bacterium recognized as the chief infectious cause of healthcare and antibiotic-associated diarrhea, mainly in elderly patients. In this context, diagnosing C. difficile infections is key to improve patient outcome and avoid complications and septicemia. In addition, an accurate and rapid diagnosis enables to stop contaminations at hospitals and reduce high financial expenses associated with such infections. As the leader in clinical microbiology testing, bioMérieux's ambition is that every infectious disease laboratory will find a solution adapted to its need within bioMérieux C. difficile range of products. bioMérieux's offering already includes chromID® C. difficile culture media and VIDAS® C. difficile Toxin A&B assay for the detection of C. difficile Toxins A&B secreted by the bacteria. In line with this long-standing expertise in C. difficile control and detection, bioMérieux recently launched VIDAS® C. difficile GDH, for the automated detection of GDH, a specific enzyme produced by C. difficile. This innovative, qualitative assay will be used as an aid in the diagnosis and treatment of C. difficile infections in complement to other C. difficile assays. The combination of tests based on GDH, then toxin detection, is recommended by leading international experts as the most valuable C. difficile diagnosis solution. VIDAS® C. difficile GDH has received CE marking and is the only automated immunoassay cleared by the U.S. Food and Drug administration (FDA). VIDAS® C. difficile GDH was developed and is produced by bioMérieux in France at its Marcy l'Etoile site, where the Company's global headquarters are located. VIDAS® C. difficile GDH is used on the VIDAS®, mini VIDAS® and VIDAS® 3 automated immunoassay platforms, providing clinical laboratories with a fully automated, accurate, standardized and cost-effective solution for C. difficile diagnosis and infection control. With a reputation for quality and reliability, VIDAS® is the world's largest installed base of automated immunoassay systems in clinical laboratories. "C. difficile infections are a major concern for both health professionals and hospitalized patients, and are a leading cause of healthcare-associated infections", said Mark Miller, bioMérieux's Chief Medical Officer. "We are extremely pleased to enrich our VIDAS® menu with this new test, a welcome addition for our existing offer. Many clinical laboratories will now be able to perform the complete C. difficile detection, based on bioMérieux's solutions. With this new launch, bioMérieux shows its commitment to the fight against C. difficile infections, providing clinical laboratories with a global offer for C. difficile infection diagnosis and management." bioMérieux now offers a full solution for C. difficile, from identification to epidemiology, in order to answer to all customer needs in all infectious disease laboratories: chromID® C. difficile culture media for identification, VIDAS® C. difficile GDH and VIDAS® C. difficile Toxin A&B for automated and cost-effective identification, Etest® for antibiotic susceptibility testing and DiversiLab®, an epidemiological tool for strain typing. This range should soon be enlarged by the FilmArray® Gastrointestinal (GI) Panel, a molecular diagnostics system enabling to rapidly identify pathogens responsible for infectious diarrhea, including C. difficile, in emergency or critical situations. This panel has just been submitted to the U.S. Food and Drug Administration (FDA) for 510(k) clearance. Shortly following the 9/11 terror attack in 2001, letters containing anthrax spores were mailed to news outlets and government buildings killing five people and infecting 17 others. According to a 2012 report, the bioterrorism event cost $3.2 million in cleanup and decontamination. At the time, no testing system was in place that officials could use to screen the letters. Currently, first responders have tests that can provide a screen for dangerous materials in about 24-48 hours. Now, researchers at the University of Missouri have worked with a private company to develop a new method for anthrax detection that can identify anthrax in only a few hours. Using a virus known as a “bioluminescent reporter phage,” Stewart and graduate student, Krista Spreng, tested the phage at the MU Laboratory for Infectious Disease Research. The phage, developed by David Schofield at Guild BioSciences, a biotech company in Charleston, S.C., is injected in the sample causing anthrax to glow if present. The team also found that the method can detect low levels of anthrax bacteria and rule out false positives. The added benefit to this reporting system is its ability to show if anthrax is present and whether or not the spores are alive, Stewart said. The research, “Bacillus anthracis diagnostic detection and rapid antibiotic susceptibility determination using ‘bioluminescent’ reporter phage,” was funded by the USDA and published in the Journal of Microbiological Methods. An indigenously manufactured food and water-borne pathogen detection kit, which will help determine what causes food poisoning and common food-borne infections, and water-borne infections, was launched in India on Thursday. It will detect five pathogens — Salmonella, Staphylococcus aureus, Listeria, Vibrio cholerae, Vibrio parahaemolyticus. Developed by the National Institute of Nutrition (NIN) Hyderabad, the technology has been transferred to Bio-Serve Biotechnologies, which is experienced in dealing with molecular reagents. To be available in the market within the next 6-9 months, the kit will bring down the cost to less than 30 percent as compared to the imported systems being used now. In India, it is very difficult to estimate the extent of the problem of food-borne diseases and only the information on food poisoning outbreaks is available. However, studies show that about 13 per cent of deaths among children are due to diarrhoea, which is caused essentially by consumption of contaminated food and water. The kit for detection of food borne pathogens will be very useful to determine the causes of outbreaks of food poisoning and food borne common infections caused by eating of contaminated eggs, poultry, meat, dairy products as well as vegetables, contaminated with water borne infections," Union Health Minister Ghulam Nabi Azad said while launching the kit. The Minister highlighted that this user friendly and rapid detection system will be of immense use not only to the Food Safety Authority of India but also to the Integrated Disease Surveillance Programme, which reports on food poisoning outbreaks and to diagnostic laboratories in Government as well as to private sector. BD Diagnostics, a segment of BD (Becton, Dickinson and Company), a leading global medical technology company, announced today that it received 510(k) clearance and Clinical Laboratory Improvement Amendments (CLIA) Waiver from the U.S. Food and Drug Administration (FDA) for the BD Veritor(TM) System for Rapid Detection of Group A Strep. This is the first commercially available rapid Group A Strep test system that incorporates a digital result to receive CLIA Waiver. The new assay is cleared for use in hospitals, outpatient clinics and other patient-care settings. Group A Strep is the most common bacterial cause of pharyngitis. More accurately determining the etiology of pharyngitis can help providers make more appropriate antibiotic treatment decisions. "The BD Veritor System for Rapid Detection of Group A Strep has demonstrated proven performance as compared to bacterial culture methods, while delivering an objective test result in about eight minutes from specimen processing to results," said Alberto Mas, President, BD Diagnostics -- Diagnostic Systems. "Rapid detection enables clinicians to initiate treatment immediately in cases of Group A Strep." When used in conjunction with the BD Veritor System Reader, the Group A Strep test utilizes Advanced Nano-particle and Adaptive Read technologies to obtain an accurate result while providing objective results on a hand held reader with an easy-to-read digital display. This digital immunoassay (DIA) for Rapid Detection of Group A Strep offers healthcare professionals a new option for Group A Strep testing versus current visual read CLIA-waived assays. The BD Veritor System for Rapid Detection of Group A Strep joins the previously FDA-cleared and CLIA-waived BD Veritor(TM) System for Rapid Detection of Flu A+B and FDA-cleared BD Veritor(TM) System for Rapid Detection of Respiratory Syncytial Virus. These assays work in conjunction with the BD Veritor System Reader. BD plans to continue to launch additional assays on this new platform. NanoLogix, an innovator in the rapid detection, identification and determination of antibiotic resistance and sensitivity of live bacteria, announces that they have signed a distribution agreement with IVD Tech Private Ltd of Singapore. This distribution agreement provides IVD Tech with exclusive distribution rights for sales of NanoLogix products in a number of Asian countries. The agreement was finalized and signed in Hubbard Ohio with the help of Mousa Kassis, representative of the Ohio International Trade Assistance Center (ITAC) housed at Youngstown State University. "NanoLogix possesses an amazing technology in their rapid live-cell bacteria and microorganism detection kits. Together with patented Extended Life (EL) packaging technology, IVD Tech strongly believes that NanoLogix's live-cell rapid detection kits and EL packaging technology is going to be a game changer in the diagnostics and petri plate technology space. IVD Tech is extremely blessed and excited to be NanoLogix's Asia partner. Engagement has already started with potential channel partners and end users in Singapore, Japan, China and other countries. IVD Tech's headquarters is purposely located in Singapore, a business and financial hub for Asia. Both NanoLogix and IVD Tech value Singapore's strong intellectual property protection, and close ties and proximity to other Asian countries. IVD Tech is to become the window and platform for Nanologix to access into the Asia region." NanoLogix CEO, Bret Barnhizer, stated: “It is gratifying that this agreement, which was essentially in development for a year, has been executed. We are very glad to have such an accomplished business group representing our company in an area with huge business potential. We look forward to a long and mutually beneficial relationship with IVD Tech”. In addition to a growing market presence in the United States, NanoLogix currently has business relationships in nine countries on four continents. The State of Ohio’s ITAC is working with NanoLogix, Inc. as the company continues to increase business ties with companies in Asia, Europe, South America, and Africa. ITAC will assist with further distribution agreements projected for signing with those companies and other companies in 2014. ITAC is an extension of the Ohio Small Business Development Center at YSU and the Ohio Development Services Agency. Mousa Kassis, ITAC advisor, assists companies with focusing their efforts on increasing export sales and employment, as well as assisting companies in 13 counties. The counties extend from Ashtabula (North) to Tuscarawas and Muskingum (South). Purdue University (West Lafayette, IN) researchers have developed a laser sensor device that can identify Salmonella bacteria grown from food samples about three times faster than conventional detection methods. The device, which they call "bacterial rapid detection using optical scatter technology," or BARDOT, uses a red diode laser to scan bacteria colonies on an agar plate. When the light penetrates a colony, it produces a scatter pattern, a unique arrangement of rings and spokes that resembles the iris of an eye. The pattern is matched against a library of images to identify the type of bacteria. What's more, it takes less than 24 hours to pinpoint Salmonella. Current Salmonella detection methods can take 72 hours to yield results and often require artificial alteration of the bacteria colonies. But the BARDOT system identifies bacteria colonies by using light to illuminate their natural characteristics, preserving the colonies for later study. The machine can be operated with minimal training and used in locations with limited resources, says Arun Bhunia, a professor of food science who collaborated with then-Purdue engineer Daniel Hirleman to create the machine. To test BARDOT's ability to identify Salmonella, Bhunia and his fellow researchers grew bacteria from rinses of contaminated chicken, spinach, and peanut butter on agar plates for about 16 hours. After the plates were covered with tiny spherical colonies of bacteria, they placed each plate inside BARDOT—which is about the size of a large microwave oven—and scanned the colonies. BARDOT identified Salmonella bacteria with 95.9 percent accuracy. It also individually distinguished eight of the most prevalent Salmonella serovars (distinct variations within a species of bacteria). Identifying a particular serovar helps trace bacteria to the original source of contamination. Atul Singh, postdoctoral research associate and first author of the study, says that BARDOT could be an effective preliminary screening tool, especially for food processors testing a large number of samples. And while many tools can only detect a single kind of bacteria, BARDOT picks out multiple types of disease-causing bacteria on a plate with a single scan, Bhunia says. In addition to Salmonella, BARDOT can identify E.coli, Vibrio, Listeria, Bacillus, and many more foodborne pathogens. A BARDOT-generated portrait of the microbial community in a sample taken from raw chicken is shown above. 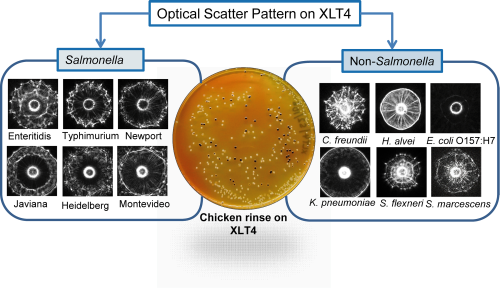 A laser beam shines through each selected bacteria colony on the plate (center), producing a distinct black and white scatter pattern used to identify the type of bacteria. BARDOT can differentiate Salmonella (left) from non-Salmonella (right) bacteria. (Image by Arun Bhunia and Atul Singh). Vivione Biosciences Inc. ("Vivione") is pleased to announce the signing of a Memorandum of Understanding ("MOU") with South Korean biotech company, AriBio, Inc. ("AriBio"). This strategic alliance is anticipated to combine the strengths of Vivione in the areas of rapid diagnostics and its new in silico compound modeling technology ("Molecular Design") with AriBio's substantial experience in drug design and testing. The alliance also initiates collaborative development efforts on Vivione's retail food freshness indicator currently branded as FQI ('Food Quality Indicator'). "We see this as a win-win for both companies," said Vivione's Chief Executive Officer, Kevin Kuykendall. "AriBio can assist Vivione with accessing the lucrative Asian market and Vivione can help AriBio with companion diagnostics and in silico compound design." Building on the Cooperative Research and Development Agreement that was signed with the FDA last year, this partnership marks another milestone for Vivione as being its first prospective alliance with a drug development company. The alliance could benefit AriBio by accelerating the drug development process via specific Vivione intellectual property, Molecular Design, which has the potential to enable accurate computer modeling of the efficacy and potential toxicities of compounds. Vivione expects the alliance will expand their food safety footprint beyond the frontline product, the RAPID-B diagnostic platform, and into companion clinical diagnostics with the potential for growth opportunities in the Asian market. "We are excited to execute an MOU with Vivione, as they have a number of potentially game changing technologies. This strategic alliance also recognizes AriBio's capabilities in efficient drug development in various disease areas including psychosis and infection," according to AriBio Chief Executive Officer Soo-Hyun Sung. "We see our divergent areas of expertise as a strong point in this collaborative effort and we are confident that this will enhance our ability to fulfill current and future technical and business objectives." The MOU will also position AriBio as an end user of other various Vivione technologies and as a distributor within Asia. AriBio will garner early visibility and access to Vivione's RAPID-B diagnostic platform, Molecular Design and Food Quality Indicator product lines, while offering AriBio a first-mover competitive advantage in the rapid diagnostic industry. One of the most exciting collaborations under the MOU is for Vivione and AriBio to jointly investigate new uses of Vivione's Molecular Design, the company's chemical engineering software solution platform, to ensure applications are compliant with local regulatory requirements while adopting global industry best practice. Kevin Kuykendall, Vivione's CEO stated, "the coupling of Vivione's new in silico product (Molecular Design) and AriBio's drug development experience allows both companies to work on a revolutionary system that may save drug development companies millions during the drug development phase. An additional benefit of Molecular Design will be the potential to expedite approvals through regulatory bodies because of Molecular Design's potential ability to predict subtle nuances in new drug compounds and allowing the drug company to design around these potential side effects". Alere Inc., a leading global provider of point-of-care rapid diagnostic and health information solutions, has announced the availability in Europe of the Alere i Influenza A & B test, the first and only molecular test to detect and differentiate influenza A and B virus in less than 15 minutes. The test is now commercially available in Austria, France, Spain, Switzerland, Germany, Italy and the UK. The proprietary technology utilises isothermal nucleic acid amplification technology (iNAT), which, unlike polymerase chain reaction (PCR) testing, does not require temperature cycling and can therefore deliver results more quickly – Molecular. In Minutes™ (MIM) – and to a broader range of settings. Alere i tests for Strep A, C. difficile, respiratory syncytial virus (RSV) and chlamydia/gonorrhoea are currently in development. Alere i Influenza A & B is currently under regulatory review in the United States by the US Food and Drug Administration (FDA) and is not available in the US pending completion of such review. 1. The clinical performance of Alere i Influenza A & B was established in a multi-center, prospective study conducted at eight US trial sites during the 2012-2013 respiratory season. A total of 571 prospective nasal swab specimens, collected from patients of all ages presenting with influenza-like symptoms, were evaluated with Alere i Influenza A & B, and compared to viral culture. All discrepant samples were tested on an FDA-cleared RT-PCR assay at a central testing laboratory to confirm influenza status. 2. Centre for Disease Prevention and Control (ECDC) Seasonal Influenza Factsheet for the General Public. [Online] http://www.ecdc.europa.eu/en/healthtopics/seasonal_influenza/basic_facts/Pages/factsheet_general_public.aspx. Date accessed: 29 October 2013. 3. Williams, KM, Jackson MA, Hamilton M. Rapid Diagnostic Testing for URIs in Children: Impact on Physician Decision Making and Cost. Infect. Med. 19(3): 109-111, 2002. 4. Bonner, A.B. et al. Impact of the Rapid Diagnosis of Influenza on Physician Decision-Making and Patient Management in the Pediatric Emergency Department: Results of a Randomized, Prospective, Controlled Trial. Pediatrics. 2003 Vol. 112 No. 2. Implementing a rapid molecular diagnostic test for MRSA among patients with purulent skin infections did not reduce the empiric use of MRSA-active antibiotics for patients with non-MRSA infections, according to researchers from the University of California, Los Angeles. The researchers compared rates of discordant antibiotic use between three separate, consecutive phases. Phase 1 (March to August 2009) was before the assay was introduced. Phase 2 (September 2009 to March 2010) took place after ED physicians were instructed to order the rapid test for all patients with purulent skin infection, and physicians were encouraged to use results in antibiotic selection. In phase 3 (April to November 2010), a pharmacist was assigned during regular week day hours to track assay results and advise physicians on alternative antibiotics if necessary. In phase 1, 31 patients (58%) were treated with discordant antibiotics for a median duration of 0.6 days. In phase 2, 35 patients (58%) were treated with discordant antibiotics for a median of 1.1 days. In phase 3, 28 patients (45%) were treated with discordant antibiotics for a median of 0.2 days. “If the PCR assay had been consistently used to guide antibiotic selection, the rate of discordant antibiotic use would have been reduced from 58% to 6.5%, with all MRSA-positive patients receiving appropriate antibiotics,” the researchers wrote. Invisible Sentinel Inc., a life-sciences company that develops rapid diagnostics for the detection of foodborne pathogens, announced today that its first-in-class rapid diagnostic for the detection of Listeria species received certification from the Association of Analytical Communities (AOAC). The Company's Veriflow® Listeria species assay (Veriflow® LS), has been approved to detect bacterial contamination by Listeria species in various food types, including ready-to-eat foods, deli meat, and dairy products, and on various surfaces with which food is in contact during preparation and packaging. Listeria species testing accounts for greater than 40% of the total volume of food-pathogen testing in the U.S.
Nick Siciliano, co-founder and Chief Executive Officer of Invisible Sentinel, commented: "This approval not only broadens our Veriflow® portfolio but also enables a far larger segment of the food and beverage industry to benefit from the advantages of our technology. The range of species detected by Veriflow® LS demonstrates the reach of this technology along with its convenience." Ben Pascal, co-founder and Chief Business Officer of Invisible Sentinel, added: "Veriflow® LS has been highly rated by our clients during the field testing of this assay which we have conducted over the past year. Like other diagnostics in our growing Veriflow® product line, Veriflow® LS features accessibility and simplicity not typically associated with other molecular technologies." With the certification of Veriflow® LS, Invisible Sentinel has now achieved AOAC approvals for three assays designed to protect against illness due to contaminated food. The Veriflow® Campylobacter assay (Veriflow® CA) and Veriflow® Listeria monocytogenes assay (Veriflow® LM) received approvals last year. Invisible Sentinel anticipates AOAC approval of a fourth product in the Veriflow® product line, the Veriflow® Salmonella species assay (Veriflow® SS), in the coming weeks. FDA has leased PathoGenetix’s RESOLUTION Microbial Genotyping System to assess the effectiveness of the proprietary bacterial strain typing system in identifying pathogens involved in foodborne illness outbreaks, and in shortening decision and response time in public health investigations. PathoGenetix, Inc., developer of an automated system for bacterial strain typing, announced today that it has delivered an early commercial version of the RESOLUTION™ Microbial Genotyping System to the U.S. Food and Drug Administration (FDA). The FDA is leasing the RESOLUTION System as part of a three-year collaborative agreement to evaluate the rapid bacterial identification technology for use in FDA foodborne illness outbreak investigation and response. The RESOLUTION System, based on PathoGenetix’s proprietary Genome Sequence Scanning™ (GSS™) technology, enables pathogen serotype identification and strain typing in just five hours, directly from complex mixtures such as enriched food and clinical samples. The bacterial strain information provided by the RESOLUTION System is comparable to pulsed field gel electrophoresis (PFGE), the current gold standard for pathogen typing in foodborne illness outbreak investigation and response. Identifying the pathogen strain that is causing a foodborne illness outbreak is a critical step in defining the extent of the outbreak, determining the food involved, finding the original source of the contamination and defining the scope of a product recall. The ability of the RESOLUTION System to derive useful pathogen strain and serotype information directly from a complex mixture, and to shorten the time for pathogen typing to just five hours, could allow for quicker decisions affecting public health. Current microbial identification techniques such as PFGE and whole genome sequencing (WGS) require a cultured isolate as input, and advanced, time-consuming laboratory processes for preparation and processing of food samples. Analysis of the patterns created by PFGE, or the extensive data generated by WGS, can be complex and add significantly to the time required to identify the pathogen strain and serotype. Because the PathoGenetix system is culture independent, and fully automated from sample preparation to final report, it has the potential to greatly reduce the time, complexity and skill-level required to identify foodborne pathogens in hospital and public health labs monitoring foodborne outbreaks. The research agreement also provides for FDA bacterial strains of public health interest, such as Salmonella, E. coli and Listeria, to be added to the RESOLUTION System database of pathogen “fingerprints.” Integrated bioinformatics software in the RESOLUTION System generates and compares GSS fingerprints from the input sample to an onboard database of fingerprints of known pathogen strains. The fully automated RESOLUTION Microbial Genotyping System, including instrument, bioinformatics software and database, and pathogen-specific assays, will be commercially available in Q4 2014 for use in both food industry testing and public health foodborne illness outbreak investigations. This month PathoGenetix also shipped a RESOLUTION System to Marshfield Food Safety, LLC, under an agreement with the Wisconsin-based microbiology- and chemistry-testing laboratory to conduct independent testing and feedback on use of the RESOLUTION System for pathogen confirmation and identification in food industry applications. PathoGenetix, Inc., developer of an automated system for rapid bacterial strain typing, announced today that it has signed Sparton Corporation as the design and manufacturing partner for the RESOLUTION(TM) Microbial Genotyping System. Under the terms of the agreement, Sparton will conduct design for manufacture and pilot production of a limited number of pre-commercial instruments for the RESOLUTION System, which is slated for commercial availability in 4Q2014. The RESOLUTION System is the first commercial application of PathoGenetix's proprietary Genome Sequence Scanning(TM) (GSS(TM)) technology, and has been developed for food safety testing in both the food industry and in public health foodborne illness outbreak investigations. The RESOLUTION System enables pathogen serotype identification and strain typing in just five hours, directly from complex mixtures such as enriched food and clinical samples. The bacterial strain information provided by the RESOLUTION System is comparable to pulsed field gel electrophoresis (PFGE), the current gold standard for pathogen typing in foodborne illness outbreak investigation and response. "We are thrilled to be working with Sparton as our contract manufacturing organization, and to reach this significant milestone in the commercialization of the RESOLUTION Microbial Genotyping System," said Paul Krassnoff, Director of Manufacturing for PathoGenetix. Sparton is a premier partner in the design as well as full production manufacture of class I, II, and III instruments for highly specialized medical, biotechnology, and life science technologies. "We are proud to partner with PathoGenetix on the RESOLUTION System and bring our experience in design and development to benefit this novel technology," said Mike Gaul, Group Vice-President of Medical Manufacturing for Sparton. "We are energized to begin the project and help PathoGenetix bring this instrument closer to commercialization." Pre-commercial units of the RESOLUTION System are currently undergoing testing and evaluation by government and food industry partners. Earlier this month, PathoGenetix shipped a pre-commercial version of the RESOLUTION System to Marshfield Food Safety, LLC, under an agreement with the Wisconsin-based microbiology- and chemistry-testing laboratory to conduct independent testing and feedback on use of the RESOLUTION System for pathogen confirmation and identification in food industry applications. A new biosensor designed by a US university may be able to detect pathogens in food more efficiently than ever before. Developed by scientists at Rice University in collaboration with colleagues in Ireland and Thailand, the biosensor has been outperforming tests that are considered standard in the food industry by speeding up the testing time from days to minutes. The process delivers results from a platform that can be cleaned and reused, and according to the researchers, the technology can be easily customised to detect any type of bacteria as well as different strains of the same bacterium. The system employs a set of mircocantilevers which have been decorated with different peptides that demonstrate unique binding affinities to varied strains of salmonella. Once a peptide catches a bacterium, the cantilever bends due to a mismatch in surface stress. A fine laser on the mechanism will then capture the change in the surface and trigger the alarm. Researchers at Rice compared the performance of peptide performance against that of commercial antibodies currently used for salmonella detection and found that not only were the peptides more sensitive in detecting pathogens, but the microcantilevers could also detect many different strains of salmonella at once. Biomolecular engineer at Rice, Sibani Lais Biswal was encouraged by old class mate and head of the microarray laboratory at the National Center for Genetic Engineering and Biotechnology in Thailand, Nitsara Karoonuthaisiri, to use the university’s mircocantilevers together with peptides. Biswal says that peptides proved to be ideal at detecting pathogens as they can effectively handle harsh conditions, and do not break down as easily as antibodies. “We’re very excited to see where this will lead,” said Biswal. The full study, Rapid Detection of Pathogenic Bacteria and Screening of Phage-Derived Peptides Using Microcantilevers is now available online in the American Chemical Society journal, Analytical Chemistry. Rhode Island Hospital researchers have identified components in Clostridium difficile (C. diff) that may lead to new diagnostic tools, and ultimately more timely and effective treatment for this often fatal infection. C. diff is a spore-forming bacterium that causes severe diarrhea and is responsible for 14,000 deaths annually in the U.S. The study is published online in advance of print in the Journal of Molecular Diagnostics. In this study, researchers identified components of the C. diff bacteria that can be used to develop a rapid diagnostic test to determine if a patient with a diarrheal illness has C. diff infection and, if so, if the infection is due to a hypervirulent strain of this bacterium. Such a determination may lead to more rapid initiation of appropriate antibiotics in infected patients with the hope of improving their outcome. "C. difficle can be a life-threatening infection," said Leonard Mermel, D.O., medical director of the department of epidemiology and infection control at Rhode Island Hospital. "We believe that rapid identification of this bacterium will assist in timely initiation of antimicrobial therapy and admission to a setting where the patient is more appropriately observed based on his or her signs, symptoms and strain of bacteria causing the infection." The technology revealed in this study can be integrated as a point-of-care device to help quickly detect and identify C. diff strains that pose significant health threats in hospitals and other health care settings. According to the Centers for Disease Control and Prevention, the most serious C. diff cases are in the elderly and individuals with certain medical problems. C. diff spores can live outside the human body and may be transferred to bed linens, bed rails, bathroom fixtures and medical equipment, and other areas in the infected person's environment. The incidence of C. diff has been on the rise and is increasing in severity and mortality in the U.S. and Europe. The cost of treating C. diff in the U.S. in 2008 topped $4 billion; and in 2006-07 it was responsible for an estimated 14,000 deaths in the U.S.
"With the emergence of a more severe C. diff strain (NAP1/027/B1), there is an urgent need for a highly sensitive and rapid method of detection and strain typing," Mermel said. Current methods of diagnosing C. diff include stool cultures, toxin testing, enzyme immunoassays and polymerase chain reaction. While often effective, they may be impractical for use in an urgent care setting or emergency department where patients are presenting with gastrointestinal symptoms "The assay we have developed has the potential to quickly and accurately indicate the presence of specific markers of certain hypervirulent strains of C. diff," Mermel said. "We're confident this will lead to more timely, accurate diagnosis and treatment, with the hope that fewer patients will develop serious complications from this infection." Healthcare providers should not rely entirely on rapid flu tests when determining if patients have influenza, according to U.S. health officials. Rapid flu tests used in many clinics are showing that patients do not have the flu when in fact they do (false negative), according to Angela Campbell, MD, MPH, a medical officer in the respiratory diseases branch of the CDC, NBC News reported. Rapid influenza diagnostic tests (RIDT) produce results within 15 minutes, but false negative results are more likely during influenza season when disease prevalence is relatively high. Sensitivities of rapid flu tests range from 10% to 80% compared with other more accurate tests like viral culture or reverse transcription polymerase chain reaction (RT-PCR) that take longer to produce results, according to the CDC. Specificities range from 85% to 100%. "Clinicians should realize that a negative rapid influenza diagnostic test result does not exclude a diagnosis of influenza in a patient with suspected influenza," the CDC wrote in it's summary of Influenza Antiviral Medications for the 2013-2014 season. "When there is clinical suspicion of influenza and antiviral treatment is indicated, antiviral treatment should be started as soon as possible without waiting for results of additional influenza testing." Flu is now widespread in 41 states and the H1N1 strain is causing 99% of confirmed cases, the CDC said in its weekly flu report. Healthcare workers should be ready to treat patients for the flu even if the first test is negative, the agency emphasized. Laboratory confirmation is not necessary to start antiviral treatment, as current recommendations state treatment should be started as soon as possible after illness onset, and preferably within 48 hours. The Rajiv Gandhi Government General Hospital (GH) may soon be able to help in the early detection of viral diseases, including dengue and H1N1. A molecular virology laboratory will soon come up at the hospital. The government has sanctioned funds for the facility. In addition to the GH, the labs will come up at the government medical college hospitals at Madurai, Coimabatore and Tirunelveli. The government has sanctioned a total of Rs. 4.41 crore for the labs. The purpose of setting up the lab at GH was to facilitate early diagnosis of viral diseases, including influenza, dengue and chikungunya, and provide diagnostic results in a short span of time to enable early treatment for patients using molecular techniques, according to officials. Molecular virology is an advanced methodology by which rapid detection of viruses is possible during the early stages of the disease itself, said a staff member of department of microbiology at GH. “It will help in the rapid diagnosis of communicable viral diseases, including dengue and H1N1 and also, tumour causing viruses,” she said. Viruses that are present throughout the year such as hepatitis B and C and herpes viruses will also be tested for. “Take a patient with dengue for instance. From day one to three, the body does not produce antibodies. If there is prevalence of dengue and the patient arrives with typical symptoms, her blood sample could be subjected to molecular testing. This way, the complications of dengue can be prevented,” she said. “Molecular techniques are done based on the symptoms and clinical conditions of the patients. This will benefit poor patients,” she added.